It has been a while since I made some pasta, which is surprising considering we normally have it once a week. Nice soft aubergine(eggplant) and some mushrooms and the idea of a different sauce with the pasta was created. Can’t remember which chef made this sauce on telly but with bacon, but of course just do away with the bacon and you still land up with a lovely sauce. Use any type of pasta you like. Kids will not even make out that aubergine is added to the sauce. Try and get the big fat spongy type of eggplant which is usually used for grilling or roasting. At the Indian shops its sold as brinjals for oro. Cut the tomatoes, onion and mushrooms into chunks. Peel and cut the aubergine into chunks. Mix all the vegetables except mushrooms along with garlic, rosemary, salt, pepper and oil in a baking tray. Roast the vegetables for 10 minutes. Add the mushrooms, mix the vegetables and return the tray into the oven and cook for another 5 minutes.Be careful when you open the oven door as a lot of steam is created while the vegetables cook. Stand on the side and open the door to prevent the steam from scalding your face. Take out the tray from the oven and let the vegetables cool down a bit. In the meantime, boil enough water in a saucepan for the pasta. When the water boils, add the pasta, salt and oil. Cook the pasta till just al dente or follow the timing given on the packet. Usually most pastas are done between 8 to 10 minutes. Drain out the pasta.Toss the pasta with the 2 tbsps of olive oil. Liquidize the sauce in a food processor or a blender. Add ¼ cup of water is necessary. 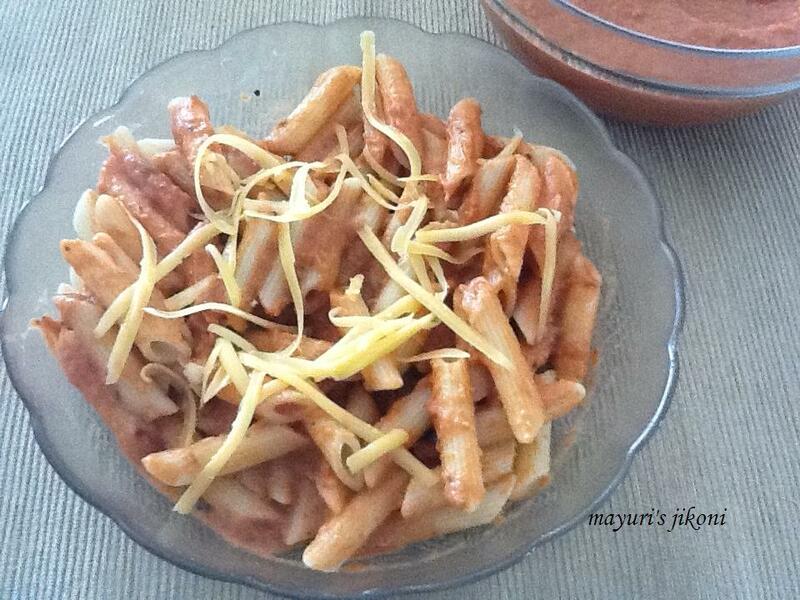 Serve the pasta and sauce separately or mixed together. Sprinkle cheese of your choice on top and serve. Add ½ cup of fresh cream or creme fraiche to the sauce. Serve the pasta with grated parmesan, crumbled feta, tiny balls of mozzarella etc. Add finely chopped green chillis.